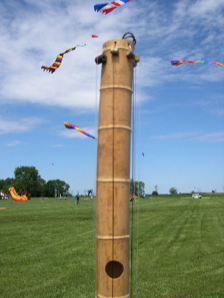 Valiha Wind Harp | Got Wind? Make Music! Consists of a pole strung with nylon harp strings. A valiha is a plucked stringed instrument from Madagascar made in a similar fashion. The idea came from Didier Ferment's site. Hear the valiha wind harp.